This necklace is comprised of three of my Honeycomb Beaded Beads strung with complimenary seed beads. This piece is the culmination of lots of samples and experimenting with a design that began as a strip of right angle weave, turned into a six-sided flat motif and evolved into eight-sided motifs joined to make six-sided 3d beaded beads! 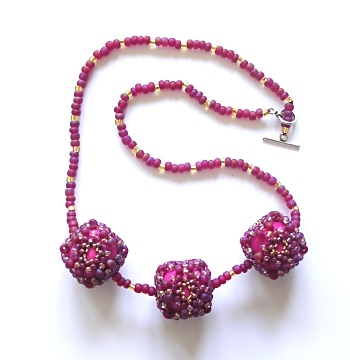 The beaded beads that feature in the necklace appear as a project in the October/ November 2006 issue of Beadwork Magazine.